The theory and data of environmental science suggest that growth in rates of population, consumption and environmental degradation, as a result of the activities of industrialized societies, has created an ecological crisis to which modern societies must adapt. However, adaptation is problematic. Max Weber studied adaptive social change during the industrial revolution. The evolution of this new way of life was initially problematic because individuals who established industrialism were socialized under feudalism. 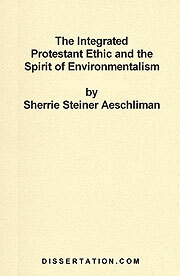 In this dissertation, I consider The Protestant Ethic and the Spirit of Capitalism as a theoretical treatise framed by modern human ecology in order to study social change in the context of the ecological crisis of industrialism. The Protestant Ethic is known for describing how religious ideas influenced the unfolding of modern capitalism in the West. However, there is nothing inherent in Protestantism that requires linkage to industrialism. I argue that Protestantism has evolved, and that it need not necessarily promote environmental exploitation, although under industrialism it has. I identify a "green" subculture within Protestantism, and consider how Protestantism's weakness may also be its strength. The very sociological structure that, in the absence of ecologically realistic norms, permits widespread ecosystem degradation by industrial capitalism may also generate ecologically realistic norms for a natural capitalism. Weber contended that rationality was problematic because it paradoxically results in a dual crisis of management and meaning where human agency becomes "imprisoned" as if in an "iron cage." The irrational continuation of environmentally degrading social practices eventually contributes to a legitimation crisis. People turn to religion as an alternative authority. If science and religion converge on environmental values, they might catalyze social change, unless they are too distorted by ideological bias. Adaptive social change only occurs if ethical and ecological values are in accordance with the sustainability of ecosystems. Hence, to adapt to the ecological crisis, sociocultural systems require socialization into ecological realism, because ecologically rational societies may still be maladaptively organized around environmentally unsustainable trajectories.